Kjell Jukola musters an army, is Magne Hovden’s third novel. 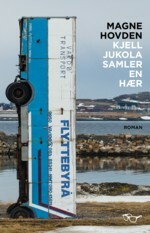 To be published in Norway by Kvalshaug Forlag, October 2014. Kjell Jukola is a forty-seven-year-old man living in the tiny arctic town of Vadsoe, in modern day Norway. He wants to secure a lasting place in history for himself. Like Napoleon and Alexander the Great did before him. So he decides to invade the neighboring tiny arctic town of Vardoe. He recruits in the welfare office, the pub, on Facebook and at the unemployment office, then rents a bus and leads his army to Vardoe to establish the nation of New-Norway. Kjell Jukola’s story is told via an author gathering information for a book about the invasion. He interviews the «soldiers» and others, and presents emails, handwritten notes, blogs and Facebook-updates, shedding light on what happened.